The Mansion House known as the official summer residence of the President of the Philippines located along Romulo Drive right in front of Wright Park is one of the most visited tourist spots in Baguio. 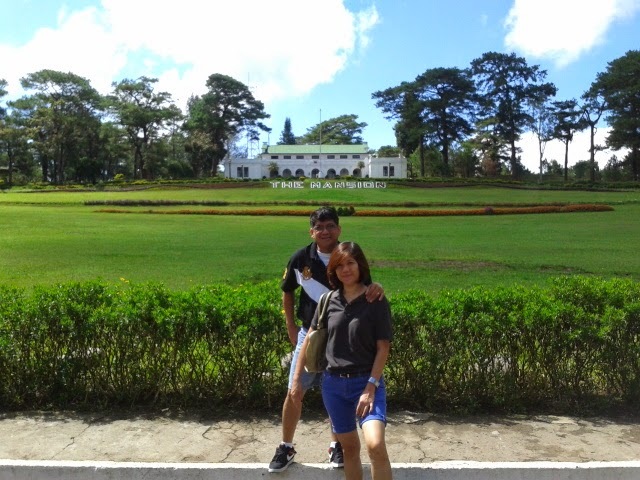 Since the hotel that I booked is just walking distance to these two land marks, The Mansion was the first place we have visited on our second day In Baguio. We arrived quite late on our first day, past 5 PM so we just had dinner at Solibao Restaurant located at Burnham Park and the rest of the night was spent in our hotel room. It was our first morning at Baguio and we were welcomed by the cool breeze while we wlak our way to the Mansion. It was just a short stop though as the guard did not allow any of the tourists to go near the building. I wonder if it's not the rule before but anyway, we just contented ourselves posing for photos in front of the building near to the main gate. It was often said that the main gate of the mansion is a replica of that of the Buckingham palace in London, England. The building was originally built in 1908 but was later rebuilt and improved in 1947. A place worth visiting when you are in Baguio.